1. Watch for the opportunity to buy during a dip of the 20 EXMA toward a rising EXMA to come near 10:40. If it sets up then, the trade is on. If not, watch for a tradable dip near 2:00. 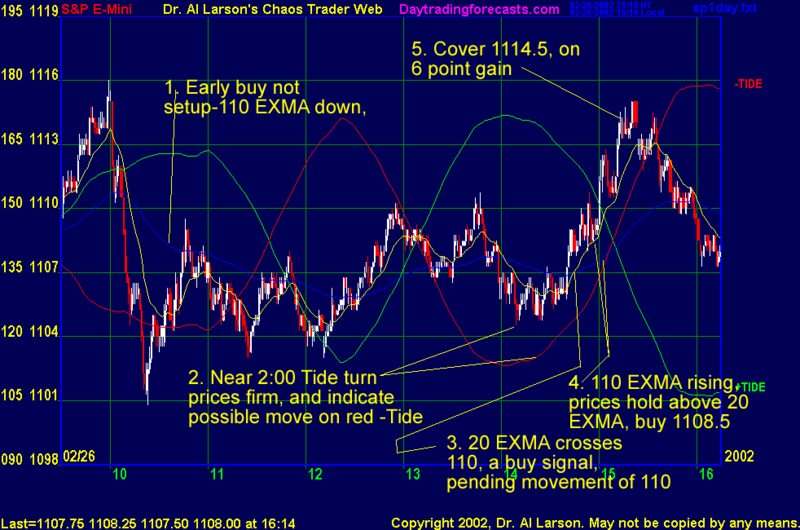 Prices should hold above the 110 EXMA and it should be rising, or curl up from a flat position. The 20 minute EXMA should have crossed the 110, or dipped toward it and then pulled away from it. When this setup is clear, enter with a 3 point stop. 3. Cover on a 6 point gain, or at 12:25 for an entry near 10:40, or 4:00 for an entry near 2:00, or if the range reaches 17 points. This setup was almost exactly as outlined, but it took a while to develop. It was a pretty clear case of tracking a forecast, and acting when the tracking indicators confirmed the forecast. When the 20 EXMA broke above the 110 EXMA, and the 110 EXMA curled up, and prices held above the 20 EXMA, and the red -Tide was forecasting a fast rally, it was a pretty reasonable trade to try. The wisdom of cashing in a a fixed target was clear here, since the gain was wiped out before the close.